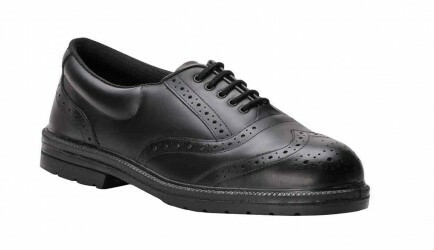 A smart, brogue style Executive Safety Shoe proving S1P safety. The smart style of the Portwest FW46 makes it ideal for more corporate work environments where both smart style and safety are essential. Manufactured in Brazilian full grain cow leather with a special moisture management fabric providing extra comfort. Safety features include, 200 joule steel toe caps, steel midsoles, and oil and slip resistant PU outsole and an energy absorbing heel. Conforms to EN ISO 20345.